Here's the good news! 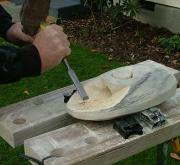 You don't need specialized stone chisels for carving New Zealand Oamaru stone. Any range of standard wood carving chisels will do the job, They are ideal for such an easy stone, it is not until you choose to sculpt much harder stone like marble that you will need to purchase professional masonry chisels. 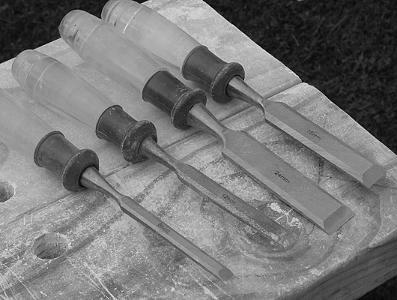 If you are very new to stone sculpture I recommend buying the standard wood chisels, the sizes shown in this picture are 6mm, 12mm, 18mm, and 24m. It is important to understand just how careful you have to be when you use this tool to carve. By applying good techniques and combining it with the portable workbench your carving experience will be both safe and satisfying. The number one rule by far is always work with the blade facing away from you. You will find this easy to do if you use a fold-able bench as you can easily walk around your sculpture to carve it. Never have the sharp edge of the blade facing any part of your body, It is amazing just how much damage it can do if it slips and cuts you. Never hold your carving with one hand and try to use the blade with the other. Always use the bench clamps to hold your carving instead. If you have never used a chisel before, the best way to hold it is in a fist like grip and as you look to the end tip, you should be able to see the beveled edge at the end. This picture best illustrates the correct procedure. Working with chisels is a big part of sculpting your stone carving. It is not until the general design is shaped out that you move on to other tools like the files and rasps There a many techniques that you will use the chisels for and it helps to have a good range of sizes in your collection. This video below is a great example of the whole stone carving process. 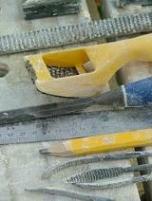 You will see that working with the chisels is a major part of sculpting in stone.